I was a guest on a podcast called BBA Baseball Talk with Dave Mitchell Show yesterday, and had a lot of fun. I have to admit that I'm a bit shy about stuff like that, so I had no experience publicly speaking about Baseball in the past. Nevertheless, I decided to give it a try. To start, I was nervous in anticipation and worried about how I would do. Overall, I had a good time and was happy with the effort. I had quite a few "ah's" moments and probably overused the word "certainly," so that's something to work on. Listen to it above. My portion of the show begins at about the 32 minute mark. BTW, I didn't feel quite as prepared at the moment as I thought I was, so forgive me if you have any disagreements with what I said. Kareem Abdul Jabbar wonders "Is it 'Next Year' for Dodgers fans?" in a piece he wrote for ESPN. Josh Suchon, host of DodgerTalk, had a run-in with Orel Hershiser as a 14 year old kid at Game 5 of the 1988 World Series and it is hilarious. Read about it here. Tom Hoffarth at the Daily News speaks with Orel Hershiser about his collection of sports memorabilia he has on auction. The Mets traveled to Toronto wearing jerseys of their favorite hockey teams. 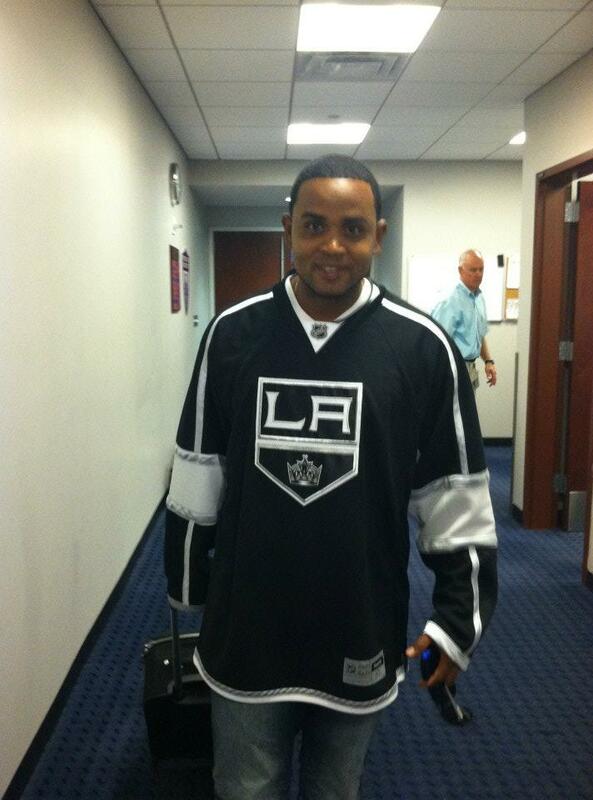 Two players wore Kings jerseys, pics via the Mets facebook. I am more than envious of Mojo Beard's most recent autograph card acquisition- an Alyssa Milano. The Toronto Standard has a great article up focused on the inspiring story of the Tanner Raboin, his rabid LA Kings fanaticism, and the friends and family who continue to honor his life. In his infancy, Tanner was diagnosed with Chronic Granulomatous Disease (CGD), which is a primary immune deficiency. CGD is a rare inherited infliction characterized by recurrent bacterial and fungal infections of the lungs, liver, lymph nodes, bones and skin. Tanner, though, was a warrior. 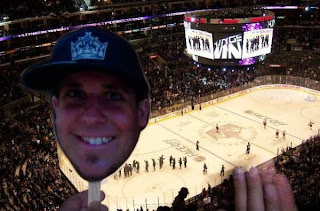 In the fall of 2010, Steven, like so many Kings fans did every preseason, prepared for Los Angeles’ annual Frozen Fury exhibition in Las Vegas. Unfortunately due to illness, Tanner was not able to make the annual trip with his father and uncles. So, Steven promised that he would figure out a way to bring the game to his son. From there, three cut-outs were made of Tanner’s head, one for Steven, and one for each uncle, Scott and Tim. Some glue was added, followed by a Popsicle stick and, lo and behold, the Tannerhead was born. Steven and his brothers dedicated their voyage to Tanner by taking hundreds of photos of them with the Tannerheads throughout the entire trip. Steven’s idea spread like wildfire. Hundreds of friends and fans generously posed in honor of Tanner. To learn more about the bone marrow “Be the Match” Foundation, please visit www.marrow.org today and see how you can help. Here are Game 3 highlights from last night. 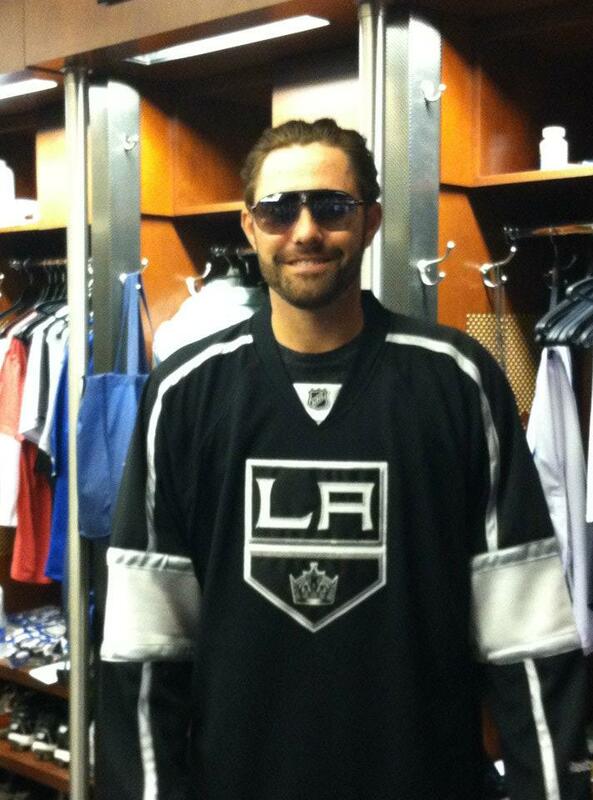 BTW, the KINGS WON!!!! WOOHOOO!!!! I don't often feature items from Mile High Card Company Auctions, but this time around I couldn't help myself. There are a couple of items that really stuck out to me, and I felt I would be remiss if I didn't point them out. 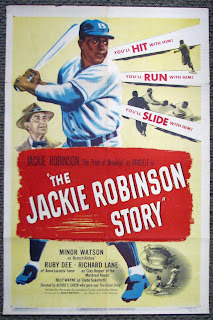 If you haven't seen "The Jackie Robinson Movie" than I gotta ask, "what's stopping ya?" Heck, you could watch it online for free, so you really have no excuse. Go to this link to watch it on youtube. Anyway, following up on that check out the below vintage movie poster for the film. 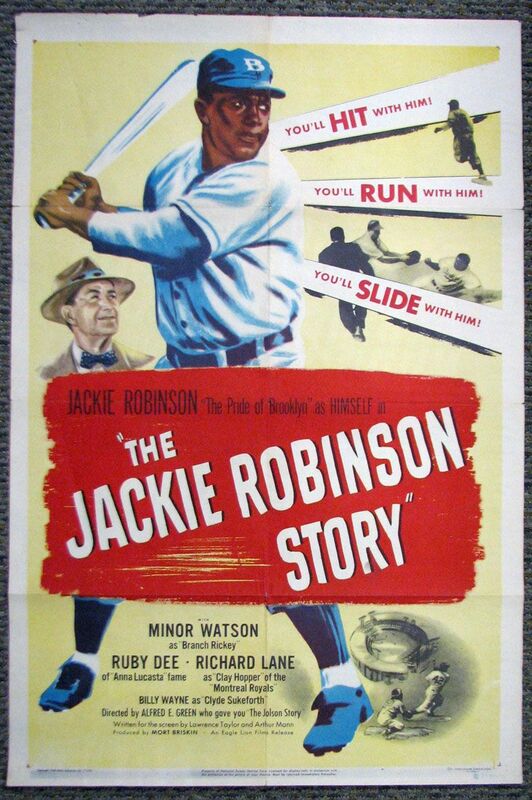 It is from 1950 and is one of the more sought after sports related movie posters in the hobby. When I saw this I knew I had to put it up. 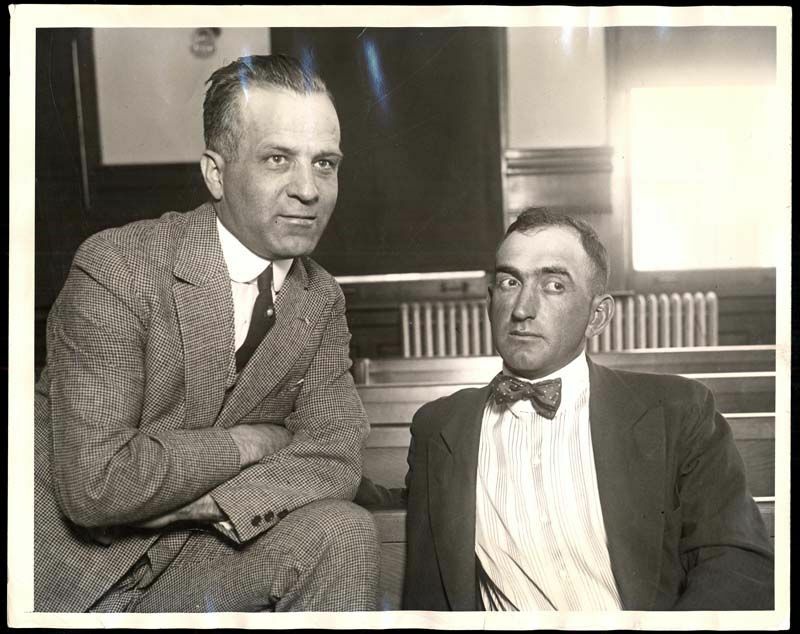 Here is a vintage press photo of "Shoeless" Joe Jackson (on the right) and Illinois Assistant State Attorney Hartley Reblogle during the "Black Sox" trail in 1921. It was taken on July 21st- which happens to be my birthday. What I love about the photograph is that little stare Joe gives. I'm sure he's wondering what the heck is going on. 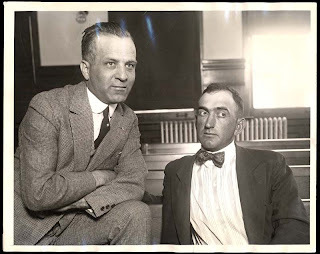 This guy to his right is trying to prosecute him, but wants a personalized photo with him? What's up with that? It's almost depressing because deep down you know that Joe Jackson was like a poor deer staring straight at a cars headlights. Since we are on the topic of Joe Jackson, check out the below press photo taken by legendary Baseball photographer Louis Van Oeyen. 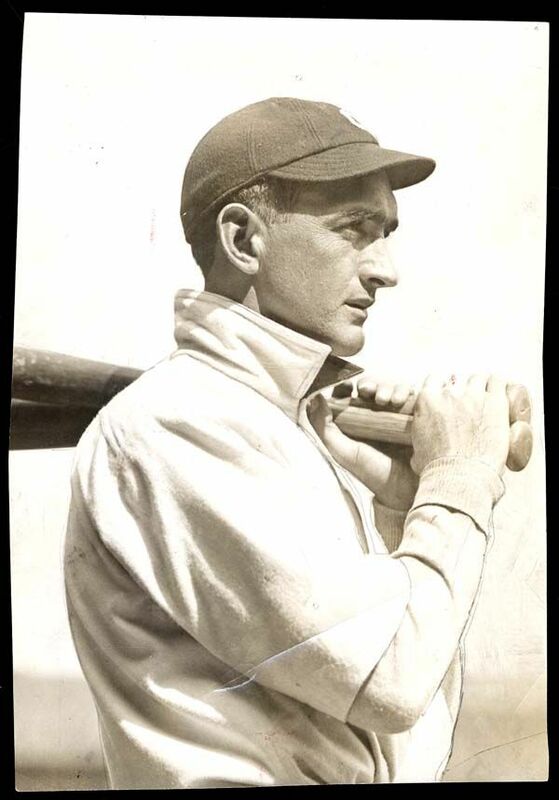 He captures Joe perfectly as he ponders his upcoming at-bat. This pic is brilliant for its clarity and subject matter.